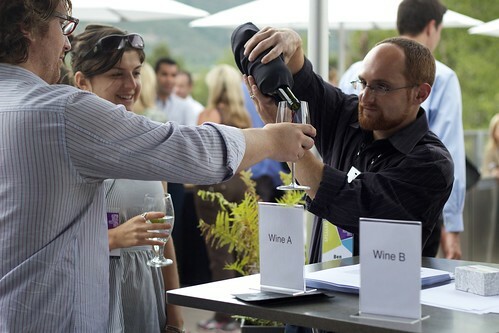 As part of the Media Lab's visit to the Aspen Ideas Festival, we designed a wine tasting experiment to showcase our technology and explore an important element of human behavior: the desire to conform to popular opinion. At the Festival's mid-week reception, on a glorious rooftop deck with Rocky Mountain vistas, we set up three tables inviting attendees to taste a pair of red wines. Participants received a sheet describing wines A and B, tasted the wines sequentially (served from masked bottles), and then chose their favorite of the two, circling either A or B on the sheet. Coco Krumme and alum Ben Waber running the wine experiment. 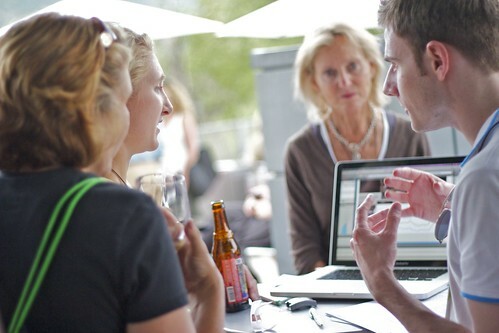 A participant samples one of the wines as Ben Waber and Coco Krumme look on. Our experiment was designed to test whether the perception that one wine was "preferred" or "special" would have an impact on an individual's preference. In addition to the (real) descriptive review of the wine, we added a fake "Robert Parker score" to each of the wines. For half of the participants, wine A had a score of 91 and B of 83; for the other half, this was reversed. In addition, the person pouring the wine emphasized the "specialness" of the wine with the higher score. At two of the tables, we additionally tested the effect on electrodermal response of priming with the points information, using two sensors placed on the fingers to capture skin conductance. Through a software interface, we recorded response as well as "events" when a person sipped each wine. Dan McDuff explains the experiment to several interested AIF attendees. At the non-sensor table, participants were about evenly split between the two settings (A is promoted as higher ranked, versus B promoted). Using a chi-squared test, we found that people preferred A when it was emphasized at a statistically significant level (p ~ 0.01). However, when B was promoted as having the higher ranking, we didn't find any effect. This suggests that the belief that a wine is special may have an effect on people's preferences: but it also depends on the wine itself. At the tables with sensors, we observed peaks in response when each wine was tasted, although there was no clear difference between tasting the promoted versus non-promoted wine. In addition, we found curious scrawlings on several of the surveys, including cryptic arrows, heart shapes drawn around the preferred wine, equal signs indicating the (mistaken) belief that the two wines were the same. A couple of participants tried to argue with us that they had "figured out" the experiment: one person was adamant that we'd switched the descriptions for the wines. In fact, each description correctly described the tasted wine, for both A and B throughout the experiment. Most people, after they'd tasted the wines, were curious about one thing: what were the wines? We can finally reveal the varietals and wineries: wine A was a Terrazas Reserva Malbec, and wine B a Ravenswood Old Vine Zinfandel. Coco Krumme is a doctoral student at the MIT Media Lab in the Human Dynamics group.